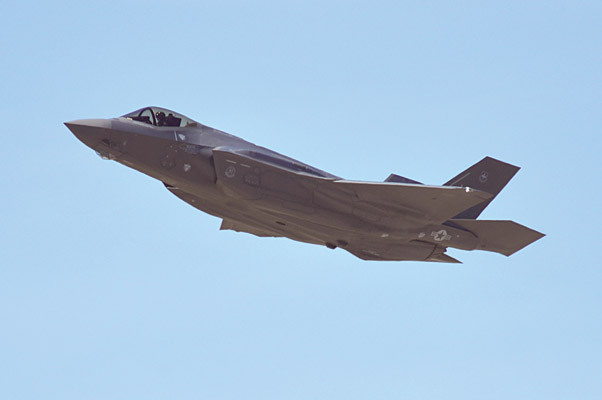 A pilot from Luke Air Force Base, Ariz., flew the 1,000th F-35A Lightning II training sortie March 31, 2015. The 56th Fighter Wing is the fastest F-35 wing to reach the 1,000-sortie milestone in the Defense Department. WASHINGTON—The Air Force is taking the future of airpower to international audiences in England this summer. The 56th Fighter Wing from Luke Air Force Base, Arizona, will send F-35A Lightning IIs to fly in heritage flights and to be on public display at the Royal International Air Tattoo at Royal Air Force Fairford, England, and the Farnborough International Airshow. This will be the first time the Air Force sends an F-35 to an overseas airshow. The Air Force Heritage Flight program features modern Air Force fighter aircraft flying alongside World War II, Korean War and Vietnam War-era aircraft in a dynamic display of our nation’s airpower history. The Royal International Air Tattoo is scheduled for July 7 through 9, and the Farnborough International Airshow will be July 11 through 17. For information on the Royal International Air Tattoo, visit http://www.airtattoo.com/, and for more information on the Farnborough International Airshow, visit http://www.farnborough.com/.